I like desserts. 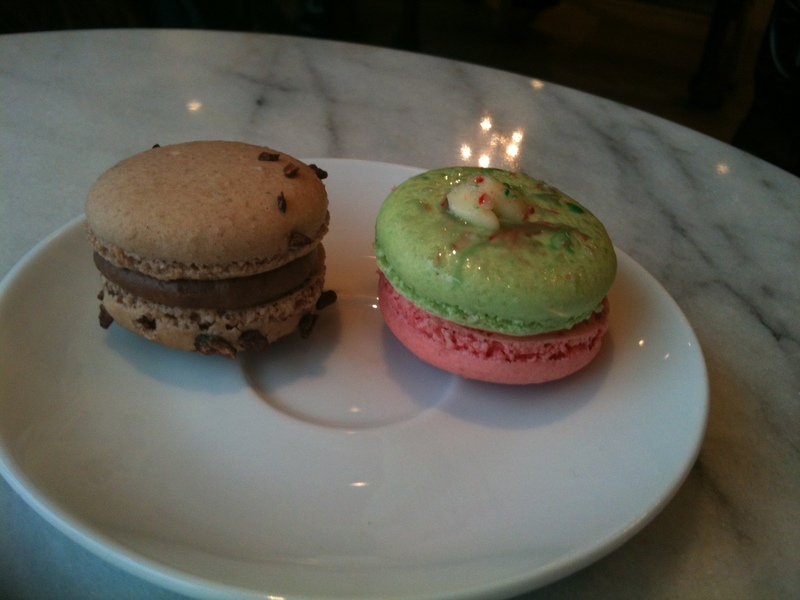 But too often desserts that look pretty taste, at best, bland, and too frequently, awful. 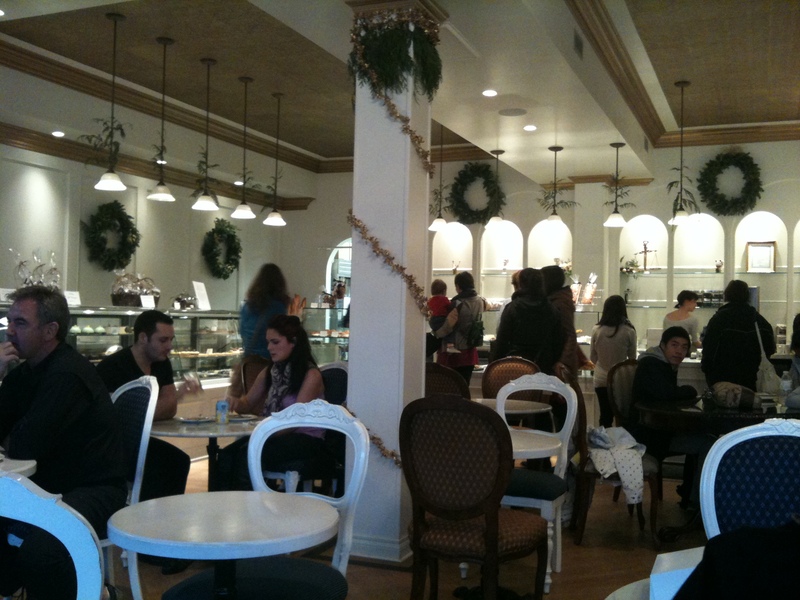 But at the Duchess Bake Shop, the desserts look AND taste fantastic. The Duchess is a new addition to Edmonton, and has been so successful that it expanded to a bigger space in fall 2011. Its success is because it takes no shortcuts. Everything is made from scratch using the best ingredients, every day. 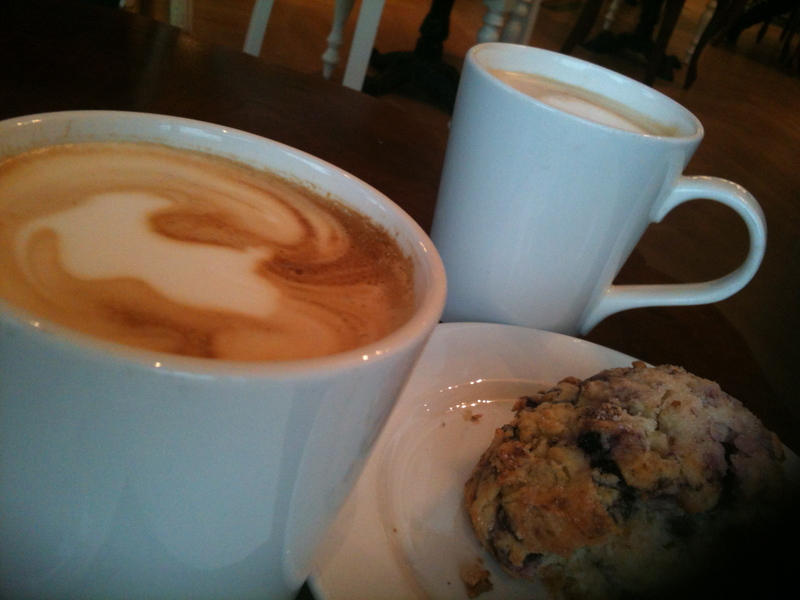 They import their butter from New Zealand and their coffee from Vancouver’s 49th Parallel. Valrhona chocolate is a given. The shop is a friendly one, with staff explaining in detail and waiting patiently while you try to make a selection from the glass cases. You can sit comfortably while you snack, even if you are a yummy mummy with 2 pre-Christmas energy-level boys (barely 5 and barely 1), their loving but slightly bewildered auntie (me), and Grandma, who is a regular. Thank goodness the Duchess had grown, because we might have felt a little more cramped and conspicuous in the smaller shop. Like their treats, the Duchess is dressed up to look sharp. Extra care is taken so that you feel like you’re in Paris (yes, even in Edmonton in December). Display cases are arranged beautifully, and staff are nattily dressed. 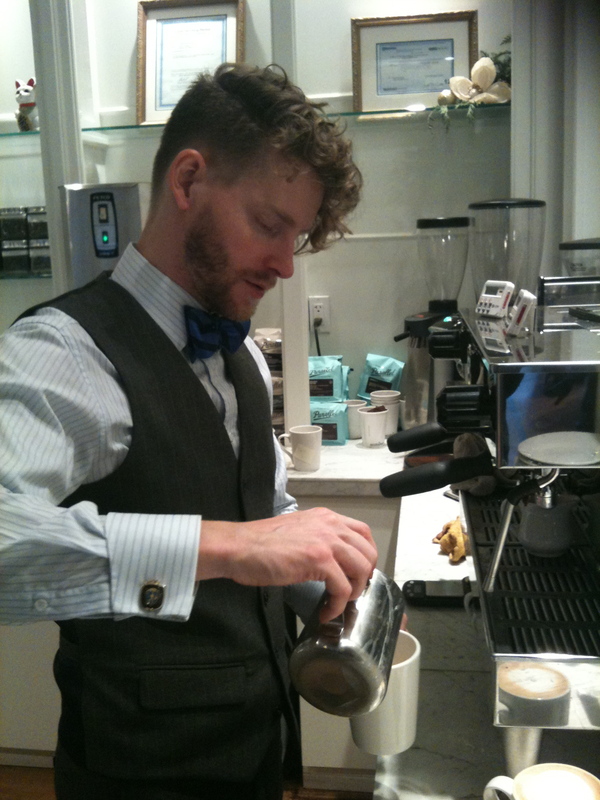 Co-owner Garner, here making a latte, is the epitome of style. There are a few savouries on offer. My sister and I split a delicious feta and spinach croissant (and then a pain au chocolat). Also available are croissant sandwiches and sometimes yummies like Tartiflette (a potato, Gruyère, onion and thyme focaccia). But the highlights are the sweets. The Duke and Duchess stand out. The Duke is rich chocolate cake, salted caramel and whipped ganache. The natural green of marzipan covers the Duchess – a chiffon cake with pastry cream, raspberry, and chantilly. There are also brioche, galettes, scones. 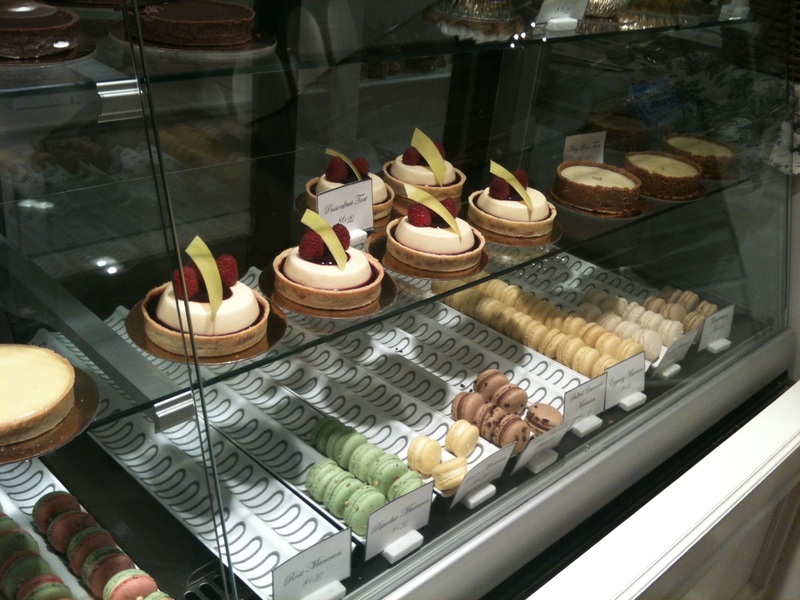 croissants, madeleines, meringues, Paris-Brest pastry, pies, cookies, brownies and more. 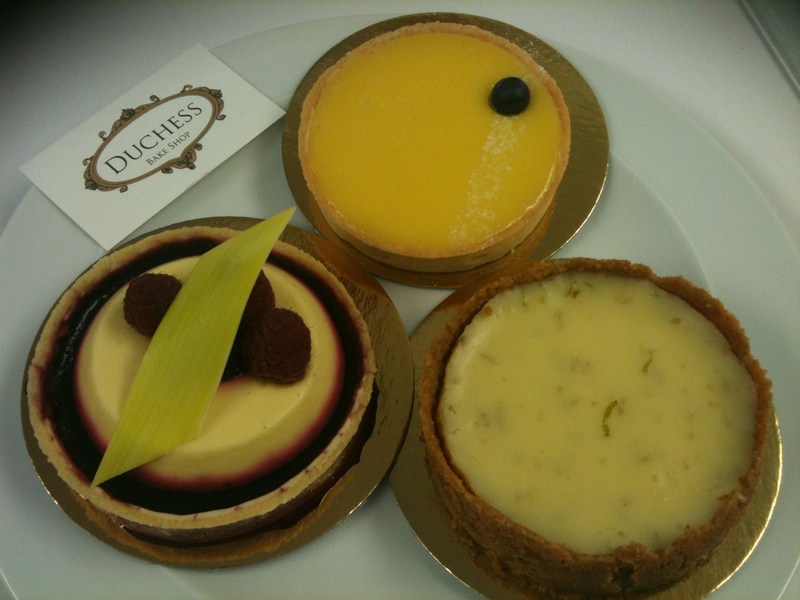 The Duchess’ tarts are the prettiest ($6). 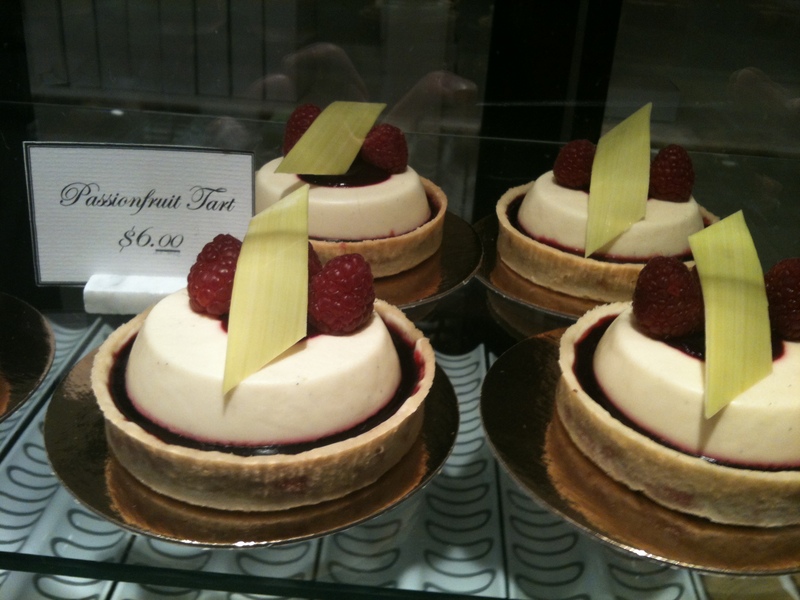 I’m a big fan of passion fruit and raspberry and this tart didn’t disappoint. The passion fruit curd was silky smooth and tart, with not a hint of gelatinyness, despite the pouffy shape. The raspberry coulis surrounding it was the perfect match, and the short crust pastry was the ideal thickness. 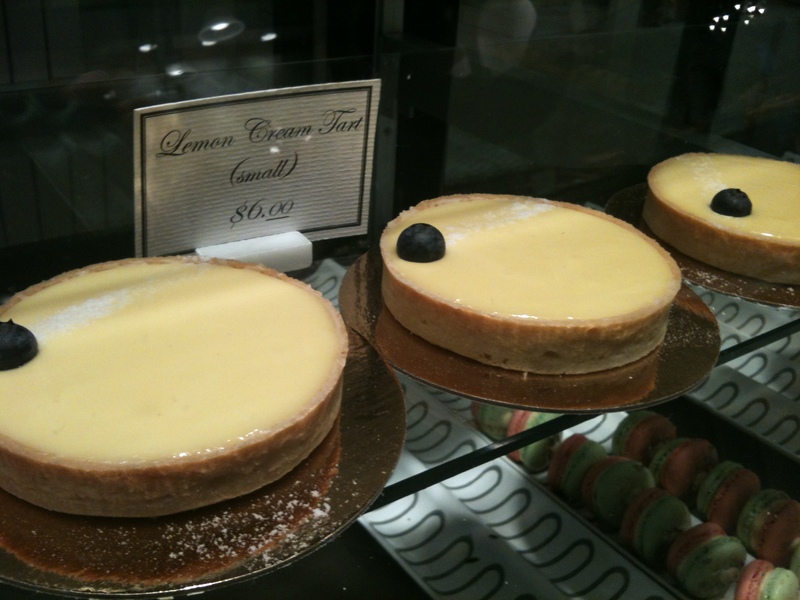 I gave the lemon curd tart high marks too. This pastry is a good test for any baker proclaiming talent: easy to be mediocre, difficult to have the perfect balance of pucker and smooth. My third bring-home treat was the lime tart – again, a lovely curd, with lime zest for extra tartness, and this time with a graham rather than short crust. You can also pick up treats which would make an excellent hostess gift: homemade marshmallows, jams and jellies, bags of shortbread, or a box of macarons. All are packaged prettily, of course, and they taste even better than they look. I hear some people complain that the prices are a little high. 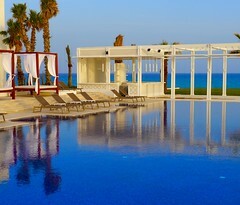 But each pastry is exquisite, hand-made daily, using only the best ingredients. 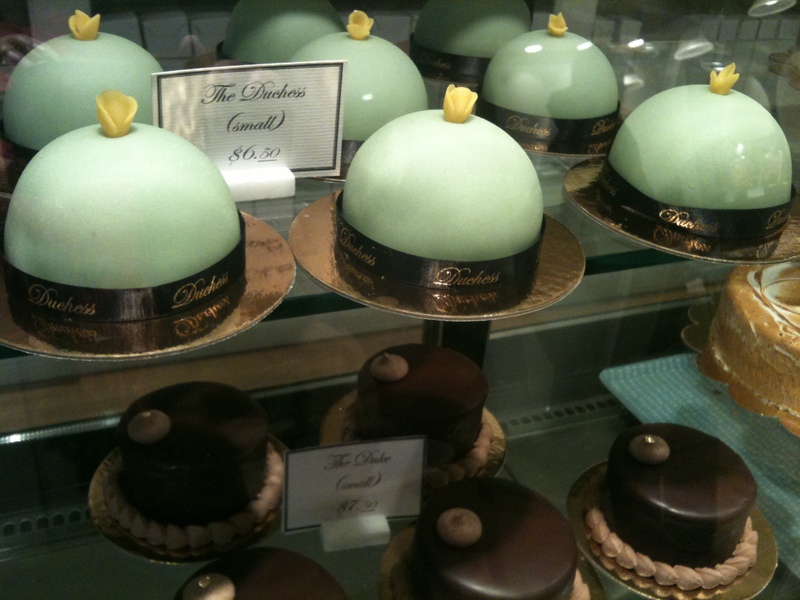 And coming from Ottawa, as well as buying these treats on vacation in NYC and France, I think the Duchess is a great deal. 10720 124th Street, Edmonton 780-488-4999. Closed Mondays (and the first 10 days in January after their Christmas rush). Like desserts? Read about a dessert dishcrawl in Ottawa HERE. And click HERE for an overview of some Harry Potter and Disney snacks.